more special offers and money saving coupons. Get One Of These For Your Site! Says "Drink Coca-Cola in Bottles" on one side that has a picture of a 1930s Coke carton on it. 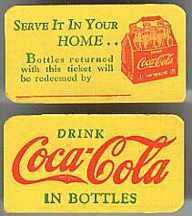 The other side says that it is a coupon from the Piqua Coca-Cola Bottling Plant in Piqua, Ohio and that if you returned 16 of these coupons they would "present you with one pack of Remembrance Quality Playing Cards of which this coupon is a sample". You get 4 for $8 (that's $2.00 each). 3" square patches found in storage at the Midwest manufacturer. Red Letters with boarder on light gray background. You get the pair for $7.50 (that's $3.75 each). 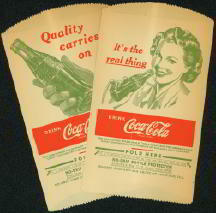 These are paper sleeves that were dispensed from old Coke machines. The refrigeration in the old machines made the bottles sweat, so you put the bottle in one of these sleeves to keep them dry. Unused stock from an old Coca Cola plant. These are not real common ones. Nice images. Unused old stock. 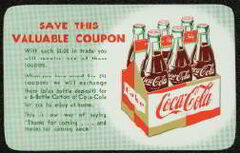 Vintage 1950's Coca Cola coupon that says "Save This Valuable Coupon". Says when you have saved 5 coupons you could exchange them for a six pack of Coke. The red and gold six pack pictured is uncommon. Nice unused stock that came from a Coke bottling plant in the South. Great condition. $4.00 ea. You get the pair for $3 (that's $1.50 each). These are paper sleeves that were dispensed from old Coke machines. The refrigeration in the old machines made the bottles sweat, so you put the bottle in one of these sleeves to keep them dry. Dated 1932. Unused stock from an old Coca Cola plant. 7" tall. These are not real common ones. Nice images. Unused old stock. Vintage circa 1950s Pops-Rite Coca Cola popcorn bags. 8 1/2" long. I bought the one case of these that turned up in a warehouse in Tennessee. The case says Blevins noiseless bags on it. The Blevins Popcorn Co. was founded by James Victor Blevins in 1945 and was nationally famous. He trademarked the name Pops-Rite around 1948 and started the “Presidential Popcorn Poll”, in which movie goers requested a Republican or Democrat box for their popcorn. The popcorn poll predicted Truman would defeat Dewey, and for 20 years thereafter accurately predicted the results of the presidential elections. Blevins sold the Pops-Rite business in 1961. They are in really nice condition. Vintage 15 1/2" wide (when unfolded) Coca Cola high school sports programs. Coke used to give these to high schools to print their lineup on. These are old stock that was never printed and are in very nice condition. This version has football players pictured on the outside and an artist signature that looks like Keller. In addition to the vintage Coca Cola bottle and cups pictured on the inside of the program, there are also graphics at the bottom showing referees' signals. This is not a real common one. These are from the 1960s. You get 3 for $4.50 (that's $1.50 each). 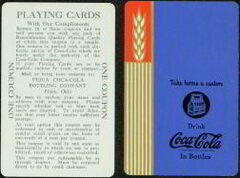 Circa 1940 Coca Cola redemption cards. 2 3/4" wide. Very thick cardboard. Both sides pictured. Vintage unused old stock from a Coke plant down South. Vintage check from the Coke plant in Jackson, TN. They are used, but were well kept and are in excellent condition. Dated 1956. Collectors try to get checks from all of the different Coke plants and from different time periods, and this is a hard one to find so they should be good sellers. Old stock found in the back room of a drive-in that closed over 30 years ago. A couple of different varieties were found. These have the older fishtail logo and are likely from the 1950s or 60s. They are 4 1/2" wide and made of paper that has nicely aged. They were for a 50¢ discount on a giant butter tub of popcorn. Old stock found in the back room of a drive-in that closed over 30 years ago. A couple of different varieties were found. These have the older fishtail logo and are likely from the 1950s or 60s. They are 4 1/2" wide and made of paper that has nicely aged. They were for a free Coke with a combination purchase of popcorn and another Coke. Vintage Coke antique and collectible. Vintage 1970s Coca Cola Coupons. Old stock found in the back room of a drive-in that closed in the 1970s. They are 5" tall and made of paper that has nicely aged. Vintage Coke antique and collectible. You get 4 for $6.00 (that's $1.50 each). This item is an ad carton and coupon attached to each other by a peforation, so you get 4 ad cards and 4 coupons. Found at the old Coke bottling plant in Frankfort, Indiana. The card and coupon are attached to each other by a perforation as shown in the picture. They come apart cleanly, but some folks like to keep them together and frame them that way. They are in excellent condition and a vintage Coke item from the 1940s. Vintage 1950s paper Coke Float poster. These are a full 20" tall and have the Coca Cola trademark on them. 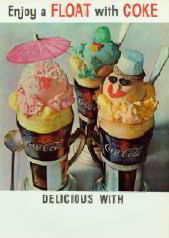 Says "Enjoy a Float with COKE" and "Delicious With". Pictures coke floats in old soda shop style coke cups. The ice cream on top of each float has faces made on it out of candy. Unused old stock found in an old Coke bottling plant. Not real common. Coke posters from the 50s like this are getting harder to find at any price! You get 3 for $1.50 (that's 50¢ each). This label has a lot going for it. The fishtail logo is an obvious early Coca Cola ripoff. It is marked Punxsutawney, PA (the home of Punxsutawney Phil the groundhog), and has a great image. It is very old (circa 1910s). They are about 4" wide and in great condition. 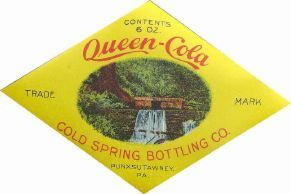 Unused stock from the old Cold Spring Bottling Co. in Pennsylvania. 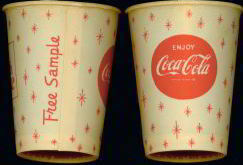 Vintage waxed Coca Cola Free Sample cup. These are really nice. Just 2 1/2" tall and very scarce. Excellent unused condition from an old bottling plant. Early 1960s. 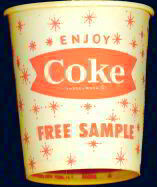 Vintage 1960s waxed Coke sample cup. They are marked "Free Sample" right up the side. They have the Enjoy logo on one side and the Things Go Better on the other. This is a very uncommon variety. I don't think many collectors will have it. 2 1/2" tall. Unused stock from an old Coke plant. 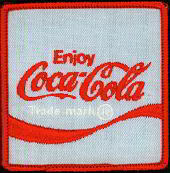 2" wide cloth Coke uniform patch. Found in an old Coke plant over 30 years ago. Guaging by the fishtail logo, they are likely unused stock from the 1950s or 60s. Vintage Coke collectible. Vintage unused pack of Coca Cola matches from the 1960s. Front cover strikers. Things Go Better With Coke logo. This older front cover striker version is not very common. You get 4 for $3 (that's 75¢ each). 3" square patches found in storage at the Midwest manufacturer. Circa 1970. Great condition. These are nice. 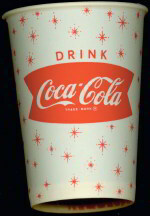 3 1/2" tall 1960s Coca Cola waxed paper cups. Great shape. 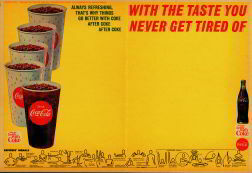 Unusual, because they have the "Enjoy Coke" logo in a fishtail type design on the one side and "Drink Coca Cola" in the same design on the reverse. The logos from this time period were usually in a circle. Vintage 1930s Albany, GA Coke Check. Old stock found at the plant. There were not that many. This is a scarce one that few collectors have. You get 4 for $2 (that's 50¢ each). Vintage 5" tall Coca Cola recipe sheet for Meats. 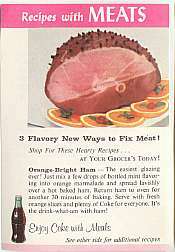 Has an orange-bright ham recipe on the front. 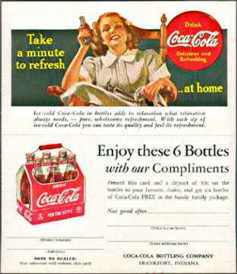 Pictures a Coke bottle at the bottom, and says Enjoy Coke with meals. Reverse is dated 1957 and has recipes for Steak Smorgasbord and Burger Booster. Nice condition. Unused stock from an old bottling plant.